When walking through the streets of Barcelona, every scene is Instagram-worthy. The city is surrounded by the most unique and inspiring architecture in the world, bursting with interesting textures and vivid color. If you ever get tired of relaxing on the waterfront with a glass of cava (which, let’s face it, you probably won’t) take some time out of your day to explore the spookier side of Barcelona. Be sure to take a friend. Boo! At the end of the 19th century, the poet Jacint Verdeguar, lived on this street and carried out several exorcism in his house, the number 7 of Carrer dels Mirallers. Locals say that the demonic spirits are still trapped inside of the house where Verdeguar lived. In 1935, the entire building of the Francisco Giner Street witnessed paranormal events. The press release’s found regarding the event entail that numerous people living in the building witnessed furniture flying around the room, and heard loud banging noises throughout the wall. The story tells that an ill child living inside of the building created the alleged poltergeists. 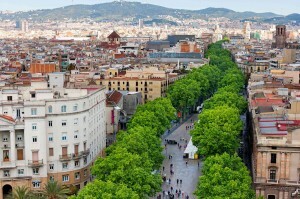 La Rambla is one of Barcelona’s busiest and most famous streets. Half way down visitors will reach the Gran Teatre del Liceu Opera House, apparently cursed with bad luck. The opera house is said to have been built on top of an execution site from the Middle Ages. Since its erection in 1847, the Gran Teatre has suffered three major fires, one including an anarchist bomb attack. Visitors walking further down La Rambla will find the Boqueria market, built over the ruins of the Carmelite Descalços de Sant Josep convent. One of the most notorious tales tells the story of a group of dead friars appearing together to sing one night to a group of horrified brothers of the congregation. The deceased choirmen marched back to their tombs in the cemetery. After the townsfolk heard stories of the walking dead, a crown attacked the convent, injuring and killing many Carmelites. Locals say that you now can hear singing in the market every night on July 25. Pablo Picasso, was born in Málaga, Spain, and would have celebrated his 135th birthday yesterday (October 25). You can visit the Museu Picasso on your tour of Barcelona, and view the most extensive collection of works by the artist. AESU offers two trips to Spain: The Euro Explorer and the Continental. If you have any questions or want help booking your Spanish adventure, please contact AESU by calling 800-638-7640, or fill out the contact form found on our website. This entry was posted on Wednesday, October 26th, 2016	at 11:24 am	. You can follow any responses to this entry through the RSS 2.0	feed. Both comments and pings are currently closed.